A veterinarian at Loro Parque, a zoo and marine park in Tenerife Spain with a disturbing history of animal welfare violations, shot a fellow park employee with a tranquilizer after mistaking him for gorilla. The park employee was actually dressed up in a gorilla costume and participating in a practice drill to simulate the escape of a captive gorilla from one of the enclosures. 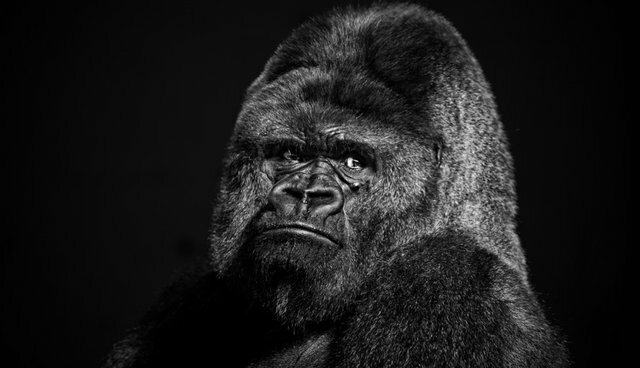 The employee was running around the park mimicking an escaped gorilla when the veterinarian spied him and, apparently uninformed about the drill, shot him in the leg with a tranquilizer dose meant to take down a 400-pound gorilla. The employee had an allergic reaction to the dose and was taken to University Hospital of the Canary Islands, where he is in serious condition. The vet, who was only hired at Loro Parque two months ago, was supposed to stop the escaped gorilla. The accident occurred during a police simulation of what should happen if a monkey were to escape the park. Drills like this are standard procedure at many zoos (at some U.S. zoos that are certified by the Association of Zoos and Aquaria, all the employees carry out various drills for animal escapes or disaster situations several times each year) -- though never has the "escaped animal" actually been shot. The bizarre story -- almost too strange to believe -- is yet another testament to the lack of safety precautions at parks like this. Even worse, this isn't the first time that Loro Parque has been the site of a horrific accident involving a park employee. On Christmas Eve of 2009, an orca whale named Keto (who was born at SeaWorld Orlando) attacked and killed a trainer, 29-year old Alex Martinez, during a training session. The event became a rallying call for many opponents of orca captivity, who say that the practice is dangerous both for people and for animals. After the appropriate emergency mechanisms for this type of situation were activated, one of the animal keepers of the terrestrial mammals was accidentally hit by a tranquillizer dart which the veterinarians have to have ready for such cases. Because of this he was rapidly assisted by the Emergency Medical Service and immediately transferred to the University Hospital of Tenerife where he was attended to and subsequently discharged. The employee has fully recovered and was released from the Hospital this morning and he would like to thank everyone for all the displays of concern and affection that he has received.